Development investments that occur early on and consistently in an individual’s life have greater positive effects in the future, with ages 15-24 being a particularly critical period of investment. As age increases, capabilities increase so long as they are in the presence of adequate private investment and government support. On the other hand, when an individual’s conditions include early starvation, lack of employment opportunities, and lack of social protection, their capabilities greatly diminish. 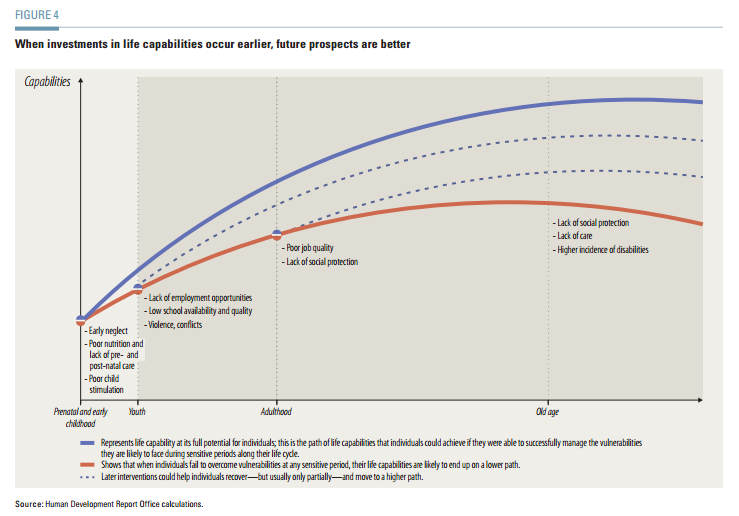 Investing early provides a path to a more stable future, and allows the human capital stock to reach its full potential. This is particularly relevant for the populations in conflict or post-conflict zones. One fifth of the world’s population, or 1.5 billion people, is affected by conflict. Approximately 45 million people – the highest number in 18 years – were forcibly displaced due to conflict or persecution by the end of 2012. 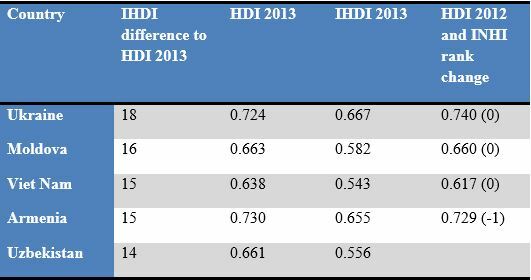 The report makes an important distinction between HDI and IHDI, showing that when inequalities are taken into account, improvements on human development may not be as representative as they appear. 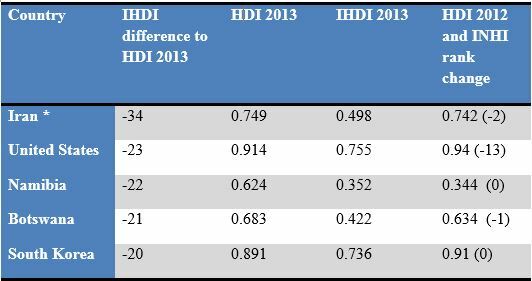 The United States for example has a -23 difference between its HDI and IHDI ranks, suggesting that inequality has a significant impact on actual human development gains. On the other hand, HDI data for some nations was positively affected by IHDI data. Ukraine saw a +18 between the two, suggesting gains against inequality, although recent developments may alter results. Notably, Vietnam, which has pushed for broad economic reforms in recent years, jumped 16 places. 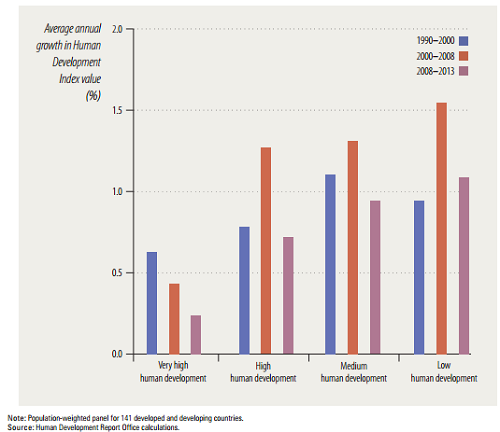 Similarly, many states with significant gains in human development also experienced economic growth over time, such as the Balkans and countries in East/Central Asia. A few states from Africa and the Middle East also had higher gains, such as Tanzania (8), while others fell, such as Angola (-17) and Nigeria (-14). Some Latin American countries also experienced hits to their HDI rankings with IHDI adjustments; Panama with a -18 difference and Brazil and Chile each falling 16 spots. Sustaining human development requires consistent focus on reducing human vulnerability and building resilience by addressing risks such as employment, nutrition, and health early on and consistently over time. Additionally, progress in human development cannot be fully measured without accounting for inequality, a point recently echoed by the OECD. It also requires a greater emphasis on collective action and coordination between governments and social institutions to mitigate transnational risks, resolve vulnerability, and a global commitment to social cohesion. For its part, the United States has increasingly incorporated resilience into its foreign assistance. The State Department’s Feed the Future Initiative and USAID’s Global Alliance for Action for Drought Resilience and Growth are primary examples that stress the importance preventative development. All in all, the report makes clear that identifying and targeting vulnerable groups to increase resilience will be a critical part of the development conversation moving forward. Julia Marvin is a researcher with the Project on Prosperity and Development at CSIS.